But thanks to Twitter I’d picked up a buzz about the “Tour Series”, a collection of town centre races designed to showcase the sport. There aren’t big names – over in Ireland Garmin’s Dan Martin, a skinny climber, managed to drop the field in the Dublin event – but just look at the photo below, from cyclingnews.com. 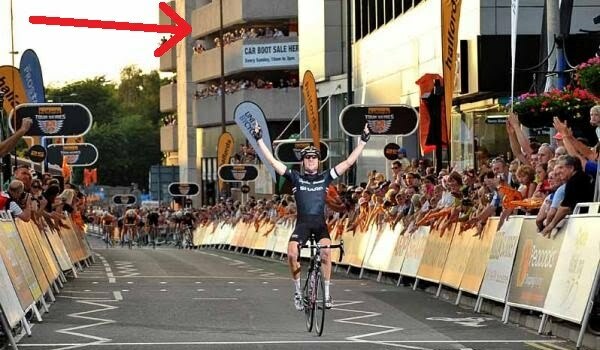 The annotation is mine, check out the crowds stealing every vantage point possible, it’s a sight to make the organisers, riders and sponsors proud. One way to start a racing scene is to use races like this, it brings a more exciting form right to the public, as opposed to a more normal road race which flashes by the countryside, often to the unique entertainment of farm animals. Here’s hoping the growing popularity of the sport in the UK can gain in momentum. I was there at the race last night in Woking – it's my home town, and I just about managed to ride down there in time from London after work. Last year when the race visited the town I was pleasantly surprised by the large crowds, but last night it seemed even more popular. People had climbed onto roofs and up into the car park (as seen above) to get a better view. Most of us have dim views of the towns we grew up in – especially if it's a nondescript commuter belt town such as Woking – but it's not a place I would have expected to embrace cycle racing so readily. After the race the riders were signing autographs and being treated with respect and a slight sense of awe. In comparison, the Tour Series kicked off in Canary Wharf in London and there was no where near the same atmosphere. Being a financial district, there's no obvious local population to come out in support. The residents of Woking seemed genuinely thrilled to have such a race in their town centre. I hope this has a knock on effect. Perhaps a higher profile for the Tour of Britain stage race, more kids entering the sport, and – from my own selfish point of view – more tolerance of the amateur road races held around the country. PS Although there are no 'big names' (though there were Olympic medalists, national champions, etc racing last night), the races are far from easy. British crit races are notoriously fast and furious. Dan Martin certainly wouldn't have dropped the field last night! The Edinburgh Nocturne was a massive success last year with big crowds to see Cam Meyer and David Millar destroy the field of mostly domestic UK pros. the old town setting and weather played a big part. Cycling purists however thought that the imbalance in the field and the unconventional course (very selective loop with a sharp cobbled climb) were not ideal. Millar is not riding this year as he is at the Tour but Meyer is returning. Here's hoping the weather is good this year- it's next weekend, Saturday 3rd July, and the world cup quarter-final does not deplete the crowd. The Tour de France prologue may be featured on big screens which might be a help. Next post: Cycling tips – what gear for the high mountains?